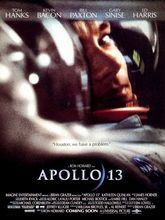 En route to the moon, Apollo 13's power and guidance systems go offline, and as oxygen starts to run out the crew must determine a way to return the capsule back to Earth. Won Oscars for Best Sound and Best Editing; received 7 additional nominations including Best Picture, Best Supporting Actor and Actress, Best Screenplay and Best Dramatic Score. Taylor Goodall ... Fred Haise, Jr.